The Spitfire is arguably the most popular mechanical 3-blade head on the market, and is manufactured by New Archery Products, well known as the makers of the #1 selling broadhead in America, the Thunderhead line. I know many, many fellow bowhunters who swear by them. I had only positive experiences while testing them. One thing I really liked about the Spitfire is the snap-locking system holds the blades in place for the shot without needing an O-ring or rubber band of some sort. It's very convenient and trouble free. It makes practicing pretty easy, especially since they provide practice blades along with the razor sharp ones. The tip on the Spitfire is very similiar to the popular tip that is on the best-selling Thunderhead line, and is a proven tip. As expected, the Spitfire provided field-point accuracy. To test the durability of the Spitfire on something similiar to the shoulder blade of a deer, I shot it through a sheet of 1/4" plywood at a distance of 30 feet. It passed completely through with no damage to any part of the head. I was interested to test out the penetrating capabilities of the Spitfire, being an expandable head and some expandables having a reputation of not penetrating as well because of the energy required to open the blades. I was particularly curious to see how the Spitfire penetrated because of it's quite large 1 1/2" cut. 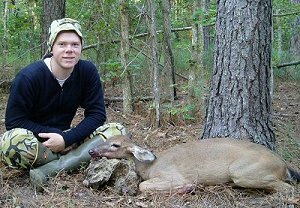 In October of 2003 I took a yearling Whitetail doe with a Spitfire on a Blackhawk Vapor arrow, shot from a Martin Jaguar at 64 lbs. Arrow speed was about 245 fps. Shot distance was 12 yards from a tree stand. The doe was quartering away and feeding slightly downhill with her head down at the shot. Shot impact was high on her body and about halfway back on the rib cage, angling forward. She immediately dropped at the shot as though spine shot and the arrow did not completely pass-through, which confused me because the point of impact on entry couldn't have hit the spine. The doe was dead within seconds, the shot having passed through the liver and lungs. I got down from my stand and when I began inspecting the shot placement more closely I discovered the answer to the mystery. Because the doe had her head down feeding, on exit the broadhead happened to squarely impact the spine where it goes into the neck, thus dropping the deer instantly. The Spitfire had practically severed the spine on impact and wasn't damaged at all. There was a huge amount of blood spilled by the size of the entrance wound. Internal damage was massive. For a mechanical head, the Spitfire performed well, but I personally will continue to use fixed-blade heads. 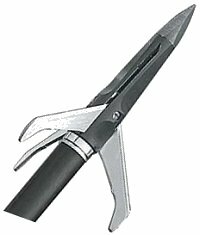 The bottom line question for me is, does the mechanical/expandable head do anything for me that my fixed-blade broadhead doesn't do equally well or better? The answer for me is no. I just have more confidence in the sturdiness of my fixed-blade heads. Because the blades on the Spitfire have to swing open freely, obviously there has to be some "give" to the rigidity of the blade positioning. However, if I was going to start using mechanicals on a regular basis, the Spitfire would be near the top of my list. It has good blade thickness, the blades were razor sharp out of the package, the tip is a proven one, and I got field-point accuracy. The Spitfire is a top-rate expandable style broadhead.